The City of Quito has a well-preserved historic centre dating from colonial times, and its streets are still dotted with churches, convents and public buildings from that period. The historic centre has conserved its original configuration, built to fit the topographical challenges being spread along the slopes of the Pichincha Volcano. Its religious buildings show the architecture, sculpture and painting of the so-called ‘Quito School’, a product of cultural syncretism between indigenous and European features. The City of Quito has been on the WH List since its beginnings in 1978. The Ecuadoreans were quick off the mark, with the Galapagos Islands also inscribed that year. From its foundation in 1534, the city always has played an important political, economic and cultural role in northern South America. During its heydays between the 16th and 18th century, numerous churches, convents, colleges and universities were founded. Still, Quito does not have the ring to it of Rio de Janeiro or Buenos Aires and isn’t a tourist magnet in its own right. Most people visit it as an obligatory stop-over on their way to the Galapagos Islands. Nicknamed ‘Florence of the Americas’, the city is high on religious art and architecture. In the retrospective Statement of Outstanding Universal Value, much emphasis is given to the Quito School of Art. In this fusion style, indigenous artists executed Spanish religious concepts. It resulted in an extreme degree of ornamentation, with bloody displays of wounds, the abundant use of gold leaf paint and the substitution of traditional European natural iconography with local flora and fauna. I started my tour of Quito’s religious buildings at the Cathedral and the Jesuit church, located in the street next to it. Both have in common that they are marketed as “museums”, and thus charge a moderate entry fee and prohibit any photography. They also charge different fees for Ecuadorean citizens and foreigners, unfortunately not an uncommon practice in Ecuador. However they do give you a very nice entrance ticket to keep. After you’ve entered the Cathedral and the Jesuit Church, you’ll know pretty well what the Quito School of Art entitles: lots and lots of gold-painted wooden decorations with a dramatic painting or sculpture in between. The Jesuit Church La Compañia even advertises itself on a plaque near the entrance as “the highest representation of Baroque architecture in the Americas”. If you want to take pictures of this particular way of decoration, your best bet is the Sagrario Chapel which is adjacent to the Cathedral. Although this isn’t the most exquisite among Quito’s churches, it displays the gilded ornamentation well and the church is free to enter. The highlight of Quito for me was the San Francisco convent complex. It is huge, covering the whole block of a large square. Sadly this square now is inaccessible and broken up for 80%, because of the construction of the Quito metro system. Works will go on to 2019. Fortunately, the interiors of the monastery and its church and chapels are also very beautiful. The church is slightly lighter in atmosphere than the other churches in the city, and the gold-coloured carvings do not prevail. Next to the church the former monastery houses a religious museum. They have an abundance of Quito School paintings, sculptures and 4 great altar pieces (see pic 2 above). I enjoyed my rounds through the museum, being almost the only visitor. Although there are quite a lot of tourists in Quito, they apparently do not enter its museums. I had the same experience the day before at the Casa del Alabado, where they show an unmissable collection of pre-Columbian art from Ecuador. 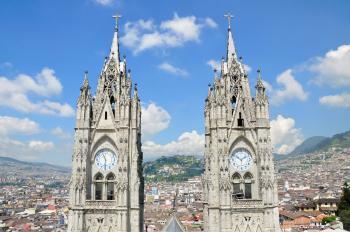 In all, the historic centre of Quito warrants a full-day visit. In addition to the sites described above, the City Museum (housed in a former hospital), the Dominican church (with its Moorish wooden ceilings) and the neogothic Basilica del Voto Nacional (with gargoyles in the form of local animals such as iguana and turtle) are well-worth visiting. Despite its steep streets the center is easily explored on foot. There’s police presence literally on every street corner, which may or may not reassure you. It all seemed quite friendly to me. It's fitting that for my one hundredth review, WHS #100 on my list of sites visited should be the City of Quito, Ecuador, one of the original twelve sites inscribed in 1978. Quito is nestled in a valley high in the Andes, and the surrounding mountains offered amazing views of the city when I visited in June of 2017. Although Quito may be rough around the edges, and care should be taken in certain areas, I felt quite safe and comfortable walking around the center. 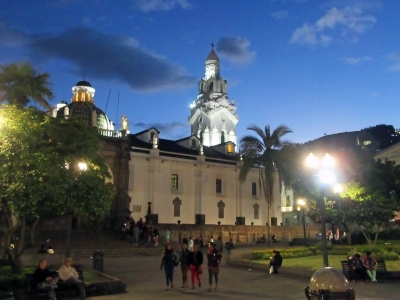 Quito was added to the WHS list forty years ago for its effective preservation of the Baroque stylings of its historic center, which can be seen in the rich, gilded interior of la Compañía church, as well as the cathedral of Quito, located on Plaza de la Independencia, Quito's central square. 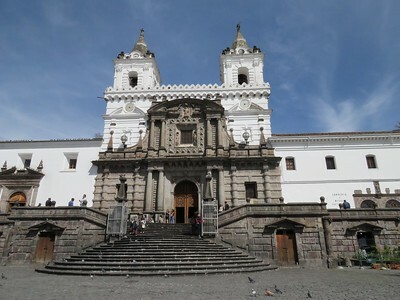 While exploring, I enjoyed learning about Quito's religious heritage through the Carmen Alto Monastery and the nearby Museo de la Ciudad (Museum of the City). I didn't make it to the winged Mary statue at the top of Panecillo hill, south of the historic center, but I did visit the Basilica del Voto Nacional, on the north side; the views of the city and surrounding mountains from the towers were incredible. On my last night in Ecuador, I spent a memorable two hours watching the sunset from the central square, and had a great conversation with an elderly gentleman who had much to talk about regarding his travels and his country. It's moments like those that make travel so worthwhile. Logistics: Quito's historic center is very walkable, although care should be taken in some areas outside the historic center; visits to the nearby Equator require a taxi or private transportation. Quito, the capital city of Ecuador, is not only my first World Heritage Site in South America but also the first place I have seen in this continent and that made this city secured a special spot in my heart. Since I arrived Quito, just a few weeks after the sad earthquake, the airport was really quite and few foreign visitors, so only 30 minutes after landing I was on taxi to the city center. The modern highway from airport really gave me a false impression of Quito, when I approached the city I was surprised of how Ecuadorians built theirs homes everywhere on the steep hills. After put my luggage in the hotel located in the middle of old quarter, I decided to explored the city immediately. The whole city was built on the small valley with grid pattern and seemed to me that the city planners did not care how steep of the road will be when built over the hills. The historic city was extremely vibrant with locals who still live and work in the old historic buildings. The narrow cobbled stone streets were unbelievably full with traffic and pedestrians. The smog and pollution were quite frustrating. Despite the chaos, the historic town is really well preserved with many beautiful churches and buildings and some areas were closed for traffic. The highlight of Quito is the Iglesia de la Compania de Jesus, the interior especially the gilded ceiling with local motif were truly amazing and mind-blowing. The famous plaza de San Francisco was indeed lovely but half was closed for subway construction. I walked to see Presidential Palace and city main cathedral and its plaza, which were just fine. Another highlight and seem to be the most popular among tourist right now was Basilica del Voto Nacional, the largest gothic cathedral in the Americas. Actually nobody seemed to care the interior, the reason to come here is to climb to the top of spire. The view was indeed very nice and I could see the whole old town peacefully after waiting until all tourists have gone. Quito at night was also very lovely as the atmosphere was dreamy of medieval town liked and less pollution. As there were many police at every corners so I felt very safe to explore city after sunset. I spent 3 days in this city and really enjoyed my times here even though the city suffered from electricity shortage, the result from earthquake. I also impressed with Ecuadorian food from really nice local stew, Lama spring rolls and Quito’s ice cream was a must try. For me, Quito gave me the feeling of India with Latino styled, while no world class landmark, the overall city was really nice to visit and enjoyed, a good place for South America introduction. We spent time in quito on both ends of a trip to the Galapagos. It was a beautiful city surrounded by mountains and churches! The people were extremely friendly and we spent time walking throughout the city. We visited the Bascilica and climbed the tower to the top where we could see the volcano in one direction and the statue of the virgin in the other direction. The Plaza of Independence was centrally located and a gathering place for the citizens. Over by the San Francisco plaza was a wonderful art store with locally made souvenirs. The streets are narrow and very hilly...reminding me od San Francisco in California. The climate was great and while the altitude was bothersome to some people; I didn't notice it. It was a very specail visit and added a great deal to our Galapagos trip. Quito, probably the most fantastic "big town" in South America. The complex of the San Francisco church-square-convent is probably the most impresive urban complex you can see in that part of the world. When you are on top of the "atrium" of the church in a normal saturday morning,wich is an open marketplace, wish its design is based of Bramante's ideas,you realize so many thinks about the the Spaniards, the "Criollos" and the "Indios". the church-convent-atrium are located in the highest part of the squeare, and it is the most important landmark in the city. From the atrium you can see the Company church, wish is probably the most refined church in America. Be prepare for the food. It just exquisite, and be prepare to walk around the historic area. Do not hesitate to get into the churches, convents and even houses. Quito got in on the “WHS act” as early as 1978 when it was 1 of the first 12 sites inscribed (I have seen it claimed that it was in fact the very first site inscribed – this may be the case but the evaluation document on the UNESCO Web site gives it a reference number of “2” which, in the original, has been manually changed from “1” whilst Galapagos is still numbered “1 bis”). It is interesting to look at the rather “thin” Advisory Body Evaluation and compare this document with the bureaucratic statements which intending sites must now have produced about them by ICOMOS . 10 years later Lima joined the party but, by that time it had to be more specific and is entered just as the “Historic Centre of Lima” whereas Quito is inscribed apparently in its entirety as the “City of Quito”! But perhaps this difference is not just a matter of changes in UNESCO policy – there is no doubt that Quito has maintained the atmosphere of a “colonial city” far more than Lima. Or rather - it “had” done so. My 2 visits were in 1973 and 1992 respectively and the city had developed considerably during those 19 years let alone the next 13 – I remember particularly that the airport which was previously “out in the country” had been gobbled up by the suburbs. I assume from reading about the city however that, despite developments around the edge, increases in traffic and no doubt some office blocks in the centre Quito has managed to maintain what was an extremely pleasant colonial centre. Indeed if its inscription as early as 1978 has meant anything then it must have done so! I remember it particularly for its wonderful setting nestled among green mountains and for the number of colonial buildings, plazas, churches and narrow cobbled streets. The climate was pleasant and the air was clear and fresh and a short bus ride away you could see snow capped volcanoes and sit astride the Equator. Maybe the air is a little less “fresh” now! The other Andean country capitals from Caracas round to Santiago, pleasant as some of them are, do not begin to match it. Mudejar style: La Compana, Santo Domingo, San Francisco, La Merced, El Sagrario, Guapulo.